When admitted in November 2009, the patient was unable to speak and exhibited much agitation (reason for first referral). Music therapy services have been provided since that time. I observed the patient lying in bed, wife and mother-in-law at bedside. As soon as he saw the paddle drum, the patient stated, “I remember the drumming and when you came to see me!” The patient immediately began playing, laughing, and singing; an instant improvement of patient’s mood as evidenced by facial affect and eye contact. 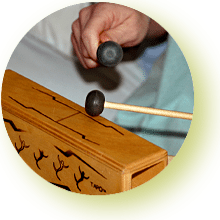 Therapists performed client-preferred songs while directing the patient to extend dominant arm to strike the paddle drum on his right, then cross midline and hit the one on his right in time with the music. The patient successfully coordinated movements and sang along with therapists throughout interventions. During “All You Need is Love,” the patient emotionally released by sharing feelings for his wife, as evidenced by tears and reaching for her hand. Patient’s family engaged in session through singing, supporting patient with hand-over-hand assistance, and encouraging the patient. A drum mallet was placed in patient’s left (deficit) hand to work on muscles needed for palmar grasp. Therapist asked the patient’s mother-in-law to help guide patient’s hand; patient often switched to dominant hand, but with assistance and encouragement from therapists and family, he successfully completed task. The therapist demonstrated how to depict different emotions through improvisation on the marimba (a xylophone-like instrument). The patient played and confidently stated his musical expression was “progress” since he was determined to get better. The patient also improvised with wife on the marimba, titling the song “Us,” both a musical and emotional moment for them, as evidenced by tears, smiles, kisses. Music therapy provided a means for self-expression, communication, and diversion from the hospital environment. The NMT intervention most used was TIMP (therapeutic instrumental music performance). Music functioned as the motivator during physical exercises to stimulate and regenerate muscles in arms. The session provided opportunities for physical rehabilitation, family bonding, creative expression, and emotional release for the patient. Thank you to the interdisciplinary team for this referral.